Jackson County prosecutor Jean Peters Baker will serve as the special prosecutor in the felony invasion of privacy case against Gov. Eric Greitens following a request from the St. Louis circuit attorney’s office. The news came hours after St. Louis Circuit Attorney Kim Gardner was officially blocked from handling the case, according to an order issued Monday by a St. Louis Circuit judge. “No elected official relishes involvement in such difficult matters as an investigation of criminal wrongdoing by another official, but we also understand our duty. I directed my staff that we will go about our review of this case as we review any case. It will be thorough and our decisions, as I have stated before, will be made without fear or favor. We will need to work as quickly as possible. We do not know what the result of the review will be. But let me stress that this review will be based solely on the evidence. Politics, affiliations or other matters beyond the evidence will not play a role. Defense attorneys representing Greitens filed motions over the weekend to block grand jury action by Gardner, but Judge Rex Burlison denied them of that motion, since Gardner agreed to have a special prosecutor review the case. “Gov. Greitens motion for temporary stay of certain grand jury proceedings is denied as moot and without prejudice based on representation by the circuit attorney’s office (CAO) that the evidence will be reviewed by a party independent of the CAO,” Burlison’s order said. Baker is now tasked with looking over the evidence and deciding whether or not to refile charges based on testimony from a woman, known only as K.S., who said the governor took an explicit photo of her without her consent and threatened to disseminate it during their affair in 2015. Greitens has admitted to the affair with the woman but has continuously denied any wrongdoing beyond that. 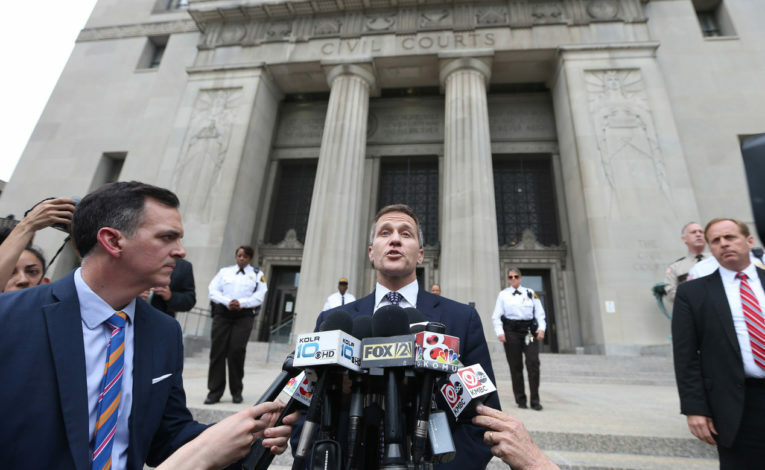 The felony invasion of privacy case against Greitens was suddenly dismissed on May 14 after the circuit attorney’s office stated they will seek a special prosecutor to handle the case. The decision came after Greitens’ defense team stated they would be seeking to call Gardner as a witness to question her over allegations of influencing witness testimony and overall misconduct. The defense team alleged that Tisaby made false statements under oath, such as when he claimed he never took notes but was seen taking them. They have also said Gardner should have corrected Tisaby about his conduct but never did. I continue to believe in the credibility of this victim. I also believe there is ample probable cause to re-issue this charge against Governor Greitens. I will be sharing the evidence we have collected on the Invasion of Privacy case with Ms. Baker immediately. I believe the accusations made by Mr. Greitens, his defense team and their political operatives are unfounded, without any merit and politically motived. Greitens faces another criminal charge regarding a count of tampering with computer data: modifying or destroying, disclosing or accessing for an incident that took place on around about April 22, 2015, in relation to The Mission Continues — the charity he started. The trial date for his second felony charge has not been set, but pretrial hearings are set to begin this week. The Missouri Legislature has also begun a monthlong special session to consider impeaching Greitens.